Jimmy Smith: 'The Sermon' In 1951, Jimmy Smith began playing the Hammond organ. Within a few years, he was considered to be THE master of the instrument. Smith also was one of the founders of the "hard bop" funk school of the 1950s. Smith's talents, including his quick agility with organ peddles, come through on this album. MURRAY HORWITZ, American Film Institute: Well, it you weren't swinging before, you are now. I'm Murray Horwitz, and today A.B. Spellman and I are bringing a new instrument into the NPR Basic Jazz Record Library. It's the Hammond organ. 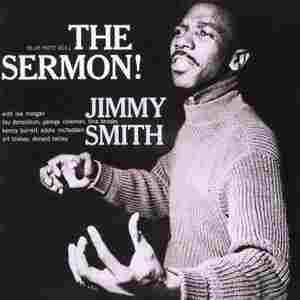 The CD is called The Sermon, and the preacher of this particular sermon is Jimmy Smith. A.B. SPELLMAN, National Endowment for the Arts: Jimmy Smith is one of the founders of the funk school of hard bop that came into prominence during the late 1950s. His commitment to it was total, his effect was seductive, and his power was undeniable. SPELLMAN: Smith has his devices. He loves to ride long, sustained notes until every ounce of emotion has been pulled out of them. He loves to quote from the standards. He loves repetition, and hard accents that are almost percussive. HORWITZ: And, most of all, he loves the blues. SPELLMAN: You got that right, Murray. SPELLMAN: The title tune, "The Sermon," is a 12-bar blues, which is in a groove from start to finish. It has some of the strongest jazz musicians of the period. That's Art Blakey's patented shuffle beat, they're grooving over. That's the impeccable Kenny Burrell playing guitar, and the prodigious Lee Morgan playing trumpet. Lou Donaldson is the alto saxophonist, and the tenor saxophonist is the underrated Tina Brooks. HORWITZ: And, let's not forget the trumpeter Lee Morgan. SPELLMAN: How could we, Murray? He was only nineteen at the time, and he was already one of the very best on his instrument. Here he is playing "Flamingo," improvising a long, languid, but highly punctuated line in the manner of Clifford Brown. HORWITZ: And something that I've always wanted to say, A.B, this musician has great feet. It's amazing to watch Jimmy Smith move those peddles on the organ. The CD is by Jimmy Smith. It's called The Sermon, and it's on Blue Note. And, it's today's inductee into the NPR Basic Jazz Record Library. SPELLMAN: For information about The Sermon, and any of our selections, please consult our Web site. HORWITZ: The NPR Basic Jazz Record Library is made possible by the Lila Wallace Reader's Digest Fund and by NPR member stations. For NPR Jazz, I'm Murray Horwitz.